Scheiding, Oliver. Brevity and Liminality in Early American Magazines. Scheiding, Oliver & Bassimir, Anja-Maria. Religion, Schrift, Differenz. Materialität im Spiegel evangelikaler Zeitschriften der USA. Scheiding, Oliver. Toward a Media History of Religious Periodicals. Scheiding, Oliver. Die Autopoeisis des Evangelikalismus. Scheiding, Oliver. Migrant Fictions and American Magazines. Von Hoff, Dagmar. Die Zeitschrift Das goldene Tor. Scheiding,Oliver. Nineteenth-Century American Indian Newspapers and the Construction of Sovereignity. Cambridge History of Native American Literature.” Ed. Melanie Benson Tylor. Cambridge: Cambridge University Press. Forthcoming. Ernst, Jutta. Amerikanische Modernismen: Schreibweisen , Konzepte und zeitgenössische Periodika als Vermittlungsinstanzen. Würzburg: Königshausen & Neumann, 2018. Studies in Periodical Cultures (SPC) published by Brill contributes to the bourgeoning field of periodical studies, exploring magazines, newspapers, and other forms of serialized media in (trans)national contexts. Research into periodicals is of high interest to many because of the medium’s pervasiveness and its enmeshment with the formation of cultural identities. 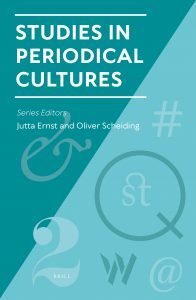 This book series seeks to assess the role of periodicals for processes of cultural transfer and translation. It also promotes the ‘business turn’ in periodical studies and highlights material and legal frameworks, design, translation, marketing and consumption. SPC proposes to study periodicals less as autonomous objects, but rather as agents embedded in changing historical contexts. Brill is a reputed international academic publisher since 1683 in the humanities and social sciences, which can boast of a thorough peer review process, high quality publications, the fastest turn-around time, a professional worldwide distribution network and state-of-the-art digital publications. Brill does not charge a publication fee and offers a personal and steady single point of contact. Brill will remain competitively priced to publish in Gold Open Access to stimulate unbarred distribution of your scholarly work. Sawade, Laura. Editorial Habitus in The Liberator: The Interdependence of Abolitionist Activism and Periodical Editorship. My current research in the field of Periodical Studies focuses on the editor function in abolitionist newspapers published during the American antebellum and Civil War eras. I primarily lean on Matthew Philpotts’ concepts of periodical editorship to elaborate on the charismatic and institutional connection between editor, newspaper, and reader. In my Master’s thesis, I apply these concepts to Frederick Douglass’ North Star. As my studies also include archival work, I am currently pursuing my research at the American Antiquarian Society in the course of an exchange program with Clark University in Worcester, Massachusetts. Meerwein. Periodical Studies. The Print Press Elite and the Government. My general field of interest in American Studies concerns transpacific relations, whereas my focus lies on the US, Japan, China, and Taiwan. In Periodical Studies, my current research pertains to the question how social and political structures in Japan restrain independent journalism. I primarily elaborate on informal rules in Japanese society that lead to self-censorship behavior in media, as well as the collaboration of the Japanese state and what Laurie A. Freeman calls information cartels. These cartels incorporate the print press elite of Japan’s biggest daily national newspapers Yomiuri, Asahi, Mainichi, Nikkei, and Sankei. Since research on issues concerning East Asia also include a variety of Japanese and Chinese sources, I attempt to participate at the Chinese Language Course program and sign up for the Japanese Department at Wenzao Ursuline College in Taiwan. Hermanowski, Mariana Sol. Overflowing the Cuba of 1910. My current research on the field of Periodical Studies focuses on the elements of transnationality present on them. Specifically, I am working with Cuban periodicals from the first part of the 20th century that refer to the intricated political and economic relations with the USA during the reconstruction period. For my analysis, I primarily use the model proposed by Robert Scholes and Clifford Wulfman. However, I depart from it since it refers to periodicals’ interactions at a national level, leaving the transnational elements a magazine can show aside. In my master thesis, I intend to attain a more comprehensive knowledge about the opinion Cuban periodicals and periodicals published in the USA by Cubans had about the first’s role in Cuba at the beginning of the 20th century.